ONE Trace box fronts as a stencil onto patterned papers and cutout individually. 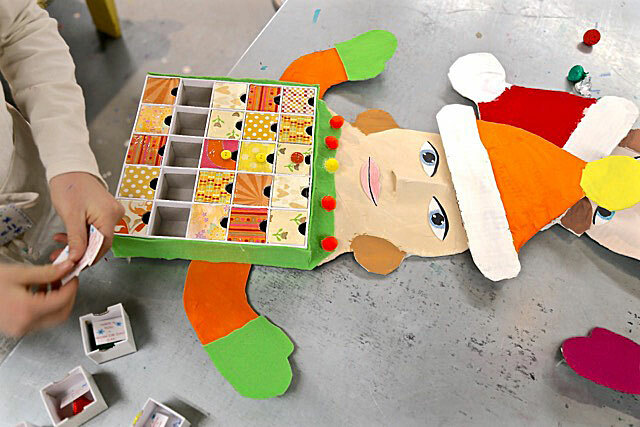 The 3D countdown calendar with mini drawers becomes the patchwork sweater of the elf, so think about a color scheme and overall pattern to unite the flow of the sweater design. This process is a bit of a labor of love but children enjoy becoming textile designers and picking papers to personalize patchwork sweaters. It can also be a relaxing time to indulge in conversation over holiday jingle! 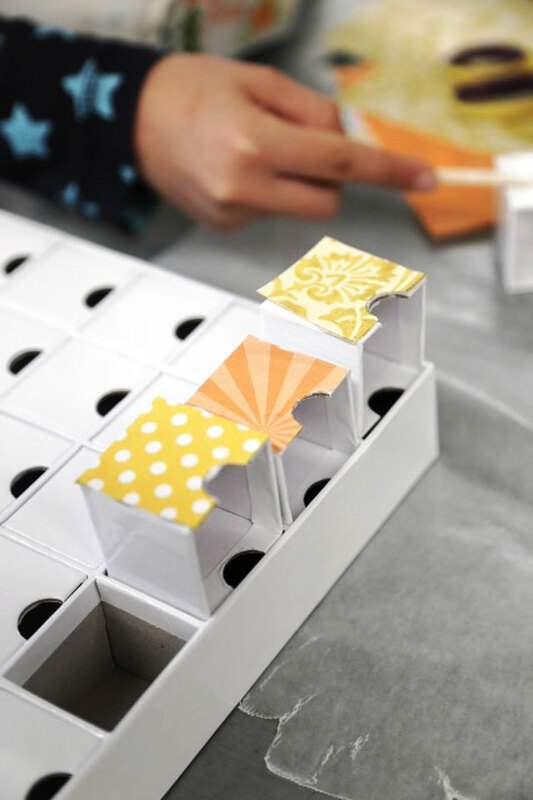 Paper pieces can be glues sticked on and reinforced with a layer of packaging tape over the top, which also finishes off the individual boxes with a glossy sheen. 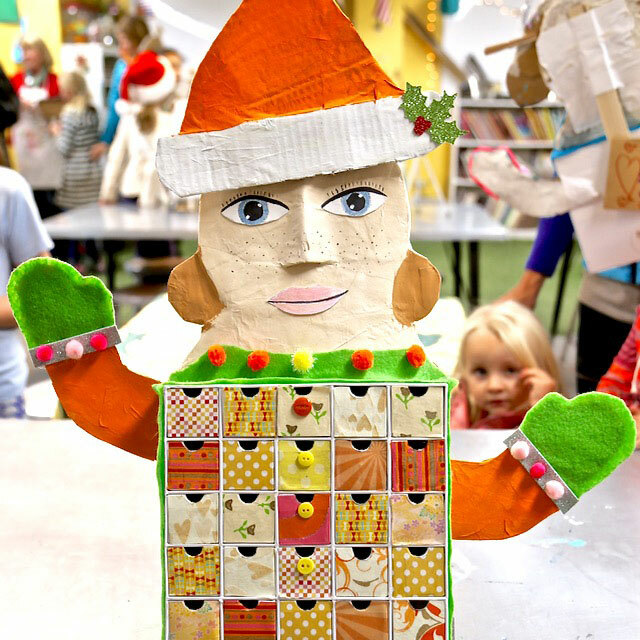 TWO Using a single ply cardboard create a general head and neck. The neck and shoulders should equal the width of the top of the patchwork sweater box to keep it all in proportion, and to make it appear united as one. To make the portrait more dimensional, fold a triangular piece of light-weight cardboard in half to create a simple nose. Use masking tape to hold in place. Use single ply cardboard to create a winter hat or ear muffs that will overlap the head. Add a simple, yet personalized hair style also using cardboard. 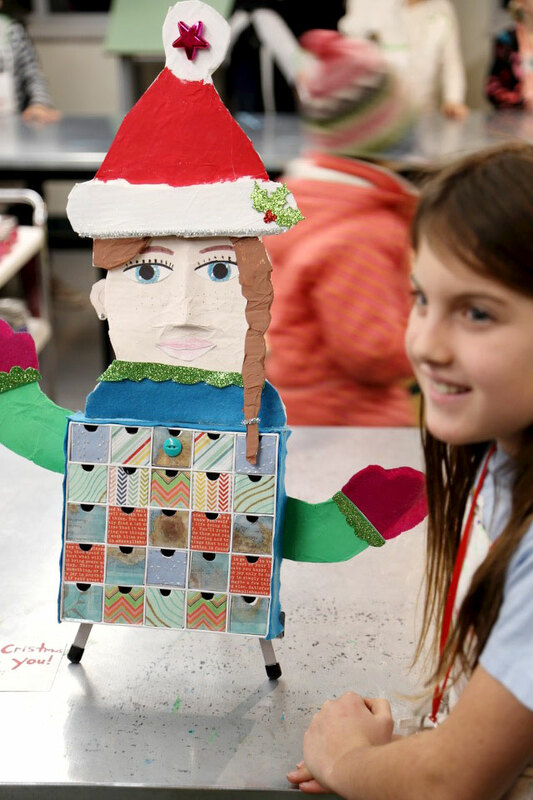 We saw clever hair styles from braids to pigtails, buns to bangs, this really was the ticket to personalize the elf to look like the artist. 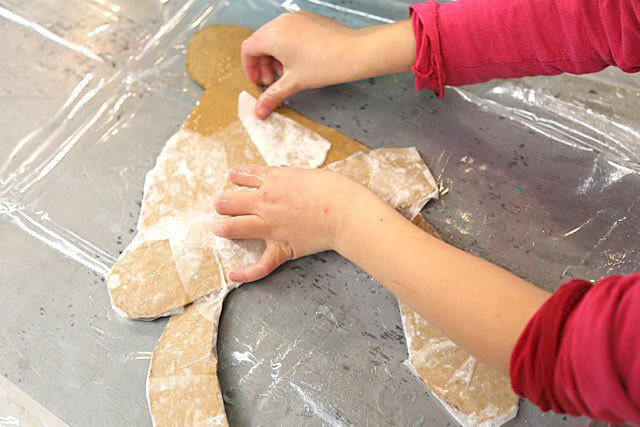 Create simple arms branched off the box sides that round upward with simple mittens. Paper mache the face and neck as one piece. Paper mache the hat and hair as one piece. Dry overnight. THREE Paint pieces separately. Artists can mix their own skin tones for their Myself the Elf Christmas Countdown. 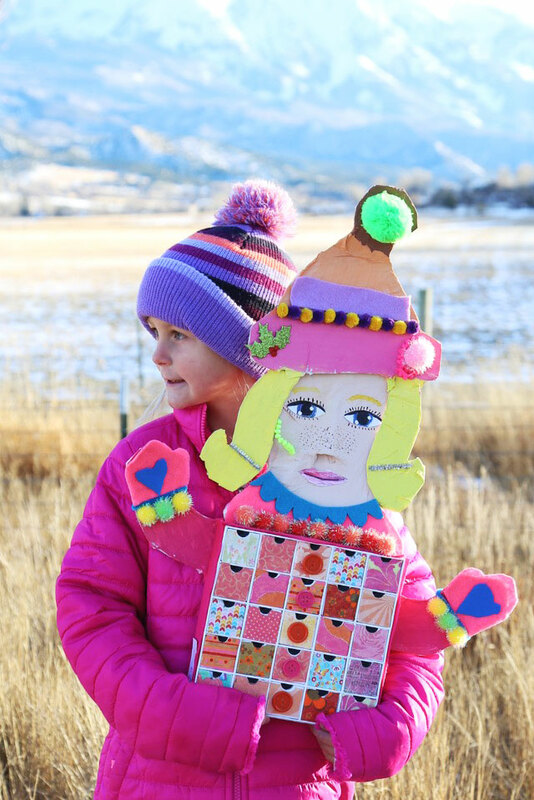 Hats and earmuffs can be painted colors to compliment the patchwork sweater. A neckline to the sweater, mittens, and scallop can be created using easy to cut felt in accent colors to compliment and simply hot glued. The head was attached with a wooden paint stir stick to the back of the box base, using hot glue, and reinforced with white duck tape so it looked crisp and finished off, yet secure and stable! FOUR General lip and eye shapes can be precut to keep a general proportion. You can observe, the eyes became a bit exaggerated, but we thought it added to the fun of these little elves. 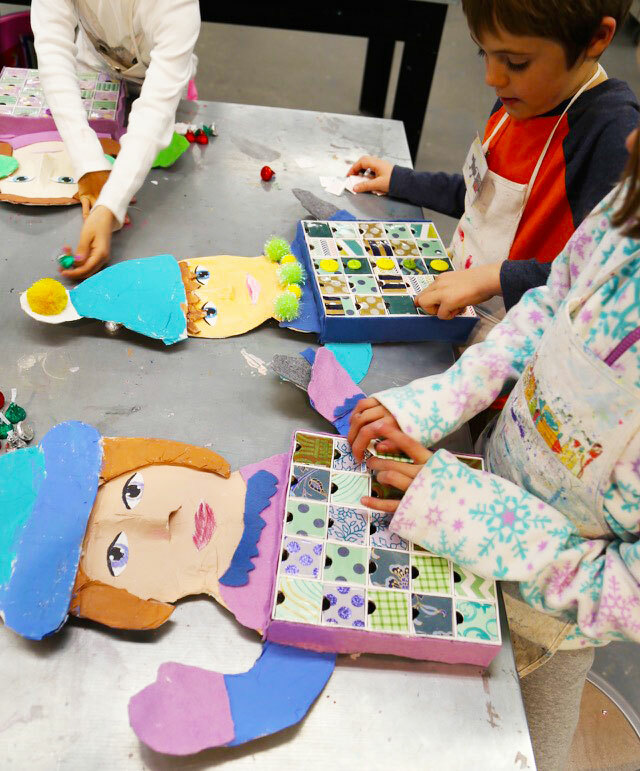 Artists can modify their individual pieces. It was exciting for artists to discover and closely observe the parts to an eye including the iris, pupil, highlights to bring a portrait to life, and of course the eye lashes. Lips can be colored using colored pencils and it’s great to use handheld mirrors to observe the details of the facial features. The Myself the Elf Christmas Countdown was filled with a sweet chocolate kiss and a square message (cut from the printable above) that suggested a festive activity for the day! I’m happy to share the above printable, just email me at hello@handmakery(dot)com! 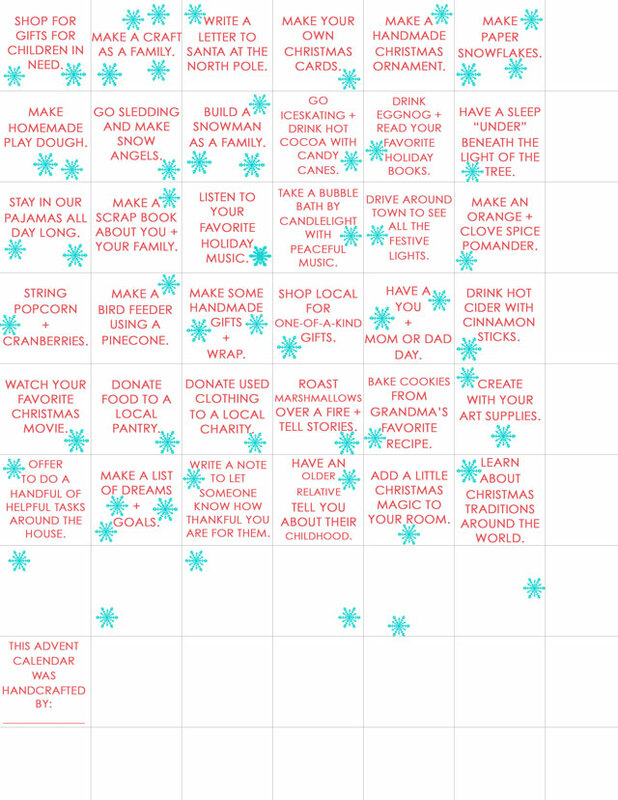 This was a list collected from a wide array of wintertime activities online and a few brainstormed. We decided to not add numbers on the boxes so this sculpture could be used year round. Believe me, a child knows which boxes still have chocolate and exactly how many days there are until Christmas, the mathematics and absolutes of childhood! FIVE Embellish. Small pom poms can be used to accent necklines. Large pom poms can highlight hat tops. Buttons can be added to patchwork sweaters. Pipe cleaners and metallic wires can connect and dazzle earmuffs. It’s amazing how much these Myself the Elf Christmas Countdowns looked like their mini makers! One of my favorite additions were freckles, rosy cheeks, and of course a snowball on the mitten! Love these ear muffs and all the sparkly + shiny details, and the cool color scheme! The overall size is rather grand! As you can see, this little maker shares many similarities to her Myself the Elf. A peek at our holiday tree that lights up our studio! 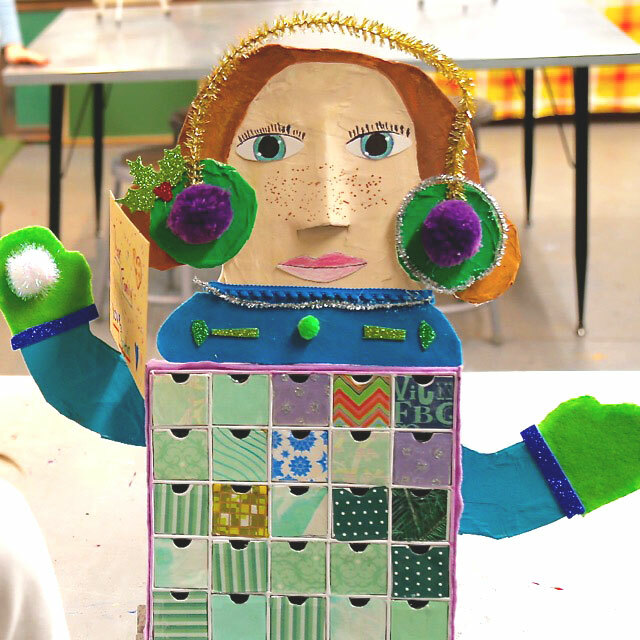 Here’s a peek at the Kidcraft101 Weekly Challenge Winner Collage guest judged by @weewarhols last week on Instagram! Look forward to having you join us this week! 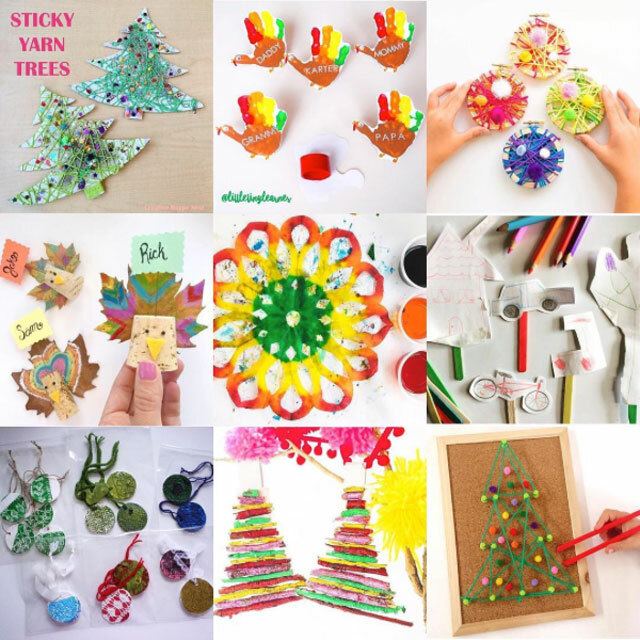 Remember to tag all your crafty creations #kidscrafts101 on Instagram and follow @kidscrafts101, co-hosts @redtedart + @incredibusy, and guest judge @handmakery! 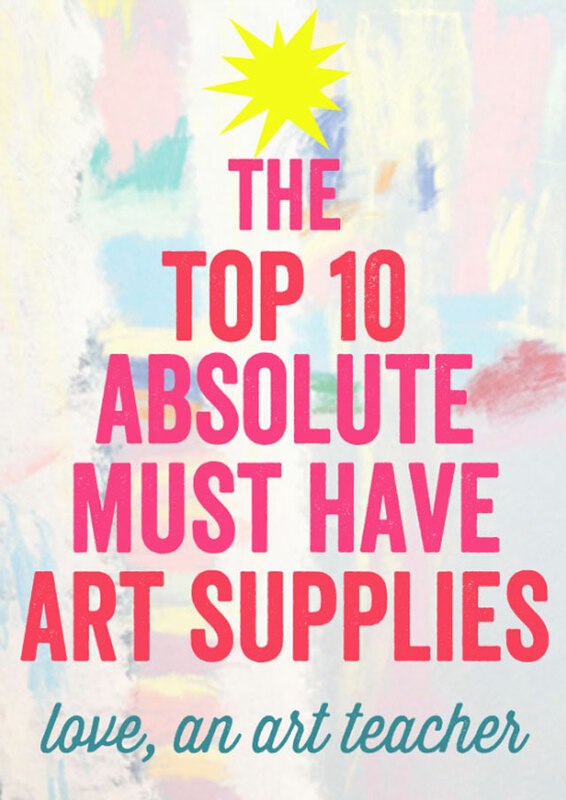 Looking for the Top 10 Absolute Must Have Art Supplies for holiday gift giving!?! A must read created by my amazing + art friend, Meri Cherry! 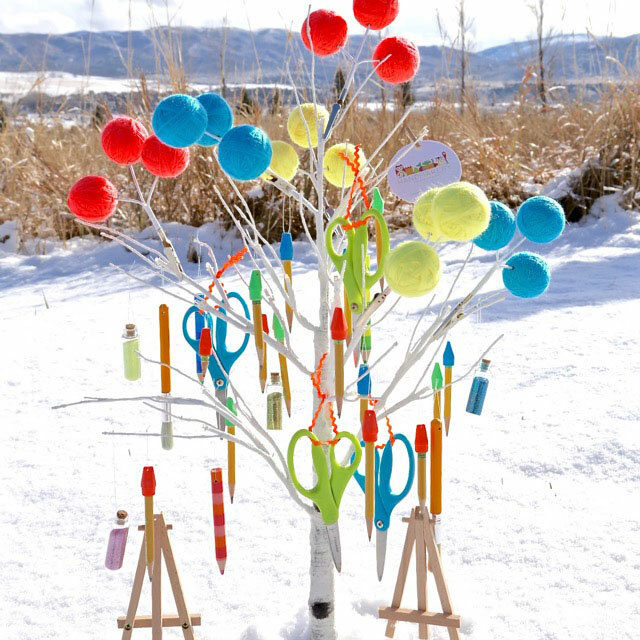 Looking for an amazing children’s art book to inspire making and creating throughout the year? 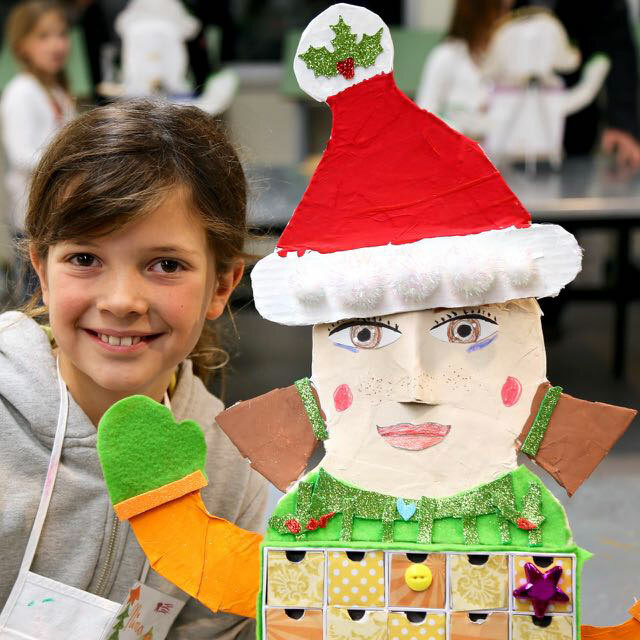 Add Art Workshop For Children to your holiday wish list! Learn more about this amazing book by joining Barbara Rucci’s Book Blog Tour! 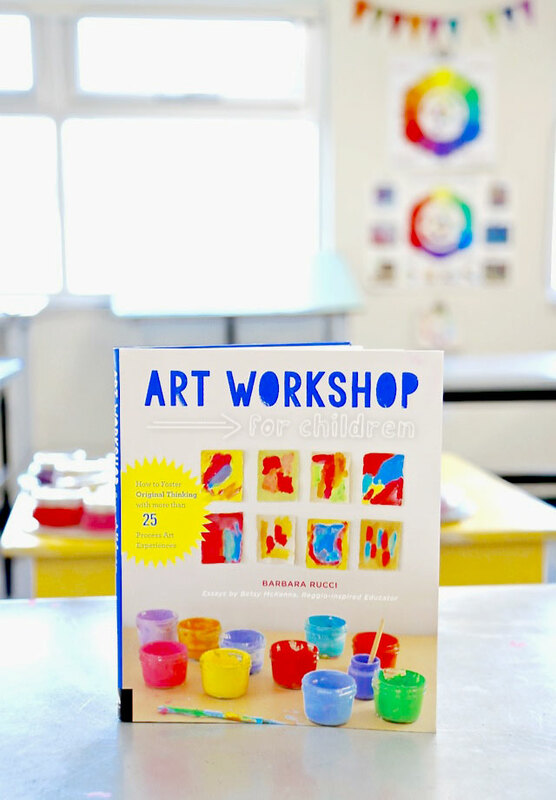 Take a peek at a few art projects we created, inspired by this new book! Hope your holiday is full of pure magic this season! Discover HANDMAKERY on Instagram + Facebook + Pinterest + Mailing List!